Hello, I’m Cristina from I Say Nomato! Today I’m sharing a recipe that is seriously mind-blowingly delicious! 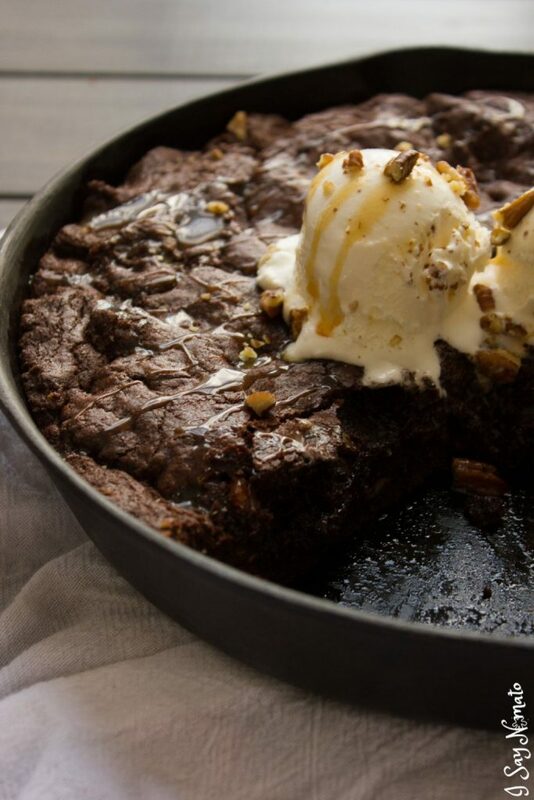 This Double Chocolate Skillet Cookie with Pecans and Salted Caramel is perfect for my fellow chocoholics! It starts with creamed butter and sugar, as all good recipes do. Then slowly add your dry ingredients, pecans and chocolate chunks. The dough will be very clumpy, but that just makes it easier to mould later on! Chocolate chip cookies receive a makeover just in time for Christmas! These Peppermint Chocolate Chip Cookies include crushed candy canes and a sweet topping. Do you have a go to cookie recipe you make every year? For my mom, it’s Sea Foam Cookies. For my cousin, it’s Fruit Cake Cookies. For me, it’s Peppermint Chocolate Chip Cookies.